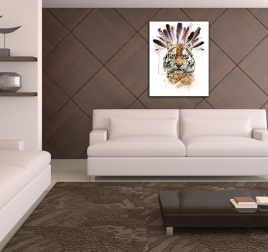 Ferocious and agile, our tiger canvases will show you this magnificent animal on a modern wall decoration ! Coloured, abstract or design, our deco tiger canvases will bring a roar of pleasure to your walls with this collection of animal canvases. This carnivore we would love to adopt is not as docile as it looks, it will be the perfect nature decorative piece for your children’s bedroom or a lounge with white walls. Very present in Hindu mythology, those tiger animal canvases will make your decoration unique. With this animal art print, draw close to a white tiger – one of the fiercest creatures of Nature. This modern canvas is 100 x 60 cm (39.37 x 23.62 po). Free delivery within 48/72 hours in metropolitan France for this contemporary art print. Each tiger art print is treated to withstand UV and moisture. 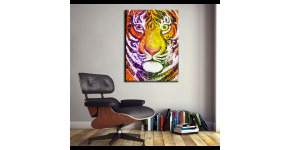 The tiger spots its prey and blends in the background to add a surprise effect, just like the effect this art print will add to your wall decoration. 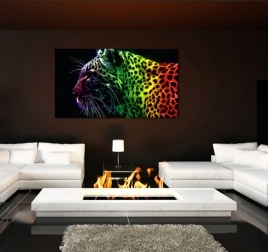 This printed canvas is 75 x 50 cm (29.53 x 19.69 po). Free delivery within 48/72 hours in metropolitan France for this tiger art print. Each art print is treated to withstand UV and moisture. A Bansky design representation on a deco picture. The dimensions of this design canvas are 80x60 cm. Free 48/72h delivery in metropolitan France for this design picture. Each modern framework is treated for UV’s and is waterproof. On this contemporary canvas, this legendary wild animal is colorfully depicted while keeping its animal charisma and its original grace. This tiger art print is 100 x 50 cm (39.37 x 19.69 po). 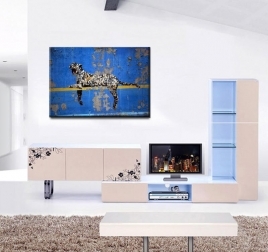 Free delivery within 48/72 hours in metropolitan France for this modern canvas. Each decorative art print is treated to withstand UV and moisture. 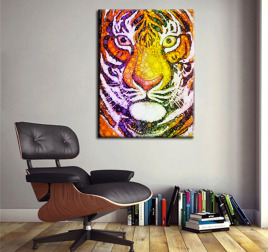 A trendy wall canvas of a tiger in a cosmic world ! The dimensions of this modern deco canvas are 60 x 80 cm. Free 48/72h delivery in metropolitan France and Belgium for this trendy printed canvas. Each Artwall and Co animal design canvas is carefully wrapped for delivery. A contemporary portrait of a tiger drawn in a modern style. Be original with this unique canvas print! This trendy art print is 60 x 80 cm (23.62 x 31.50 po). Free delivery within 48/72 hours in metropolitan France for this decorative canvas. Each decorative art print is treated to withstand UV and moisture.